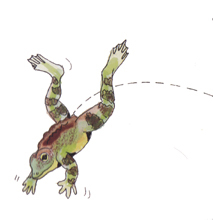 "Gail Gibbons's detailed description of the life cycle of frogs is written in age-appropriate language and illustrated with colorful, labeled drawings that explain developing body parts in the amphibian's growth from tadpole to frog. The phonetic spelling of scientific terms is helpful for beginning readers. Among the topics covered are the frog's anatomy, how it fits into the food chain, daily activities, habitats, different types of frogs, the difference between frogs and toads, and more. The full-color illustrations and two-page spreads make this an enjoyable experience for young students. Christina Moore uses her talent for storytelling to create a more narrative-like tale. At the beginning of the book, Moore gives a short description of the layout of the book and how it will be read so that children can understand and follow along. The reading of vocabulary words from the pictures at the end of each page can be distracting. Page-turn signals are optional. An attractive offering for listening centers and for young children interested in nature and science."